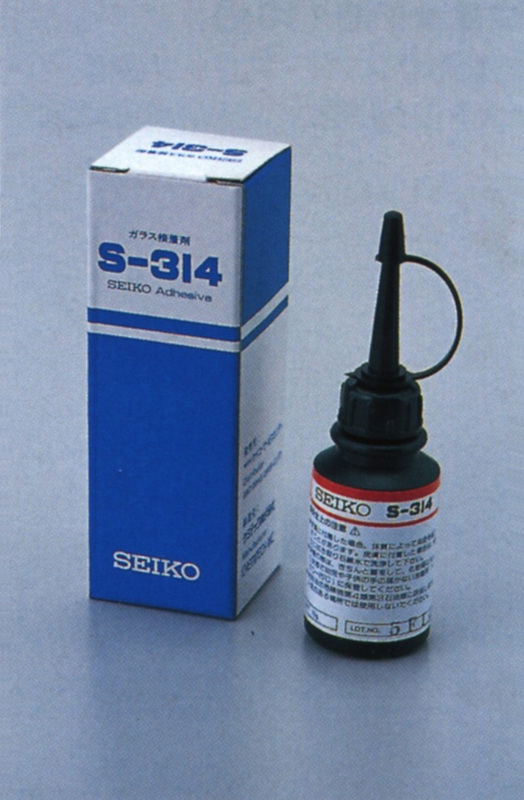 Over the years Seiko has produced a range of different tools for watch repair and maintenance. These include movement holders, test and measurement instruments and case opening and assembly tools. 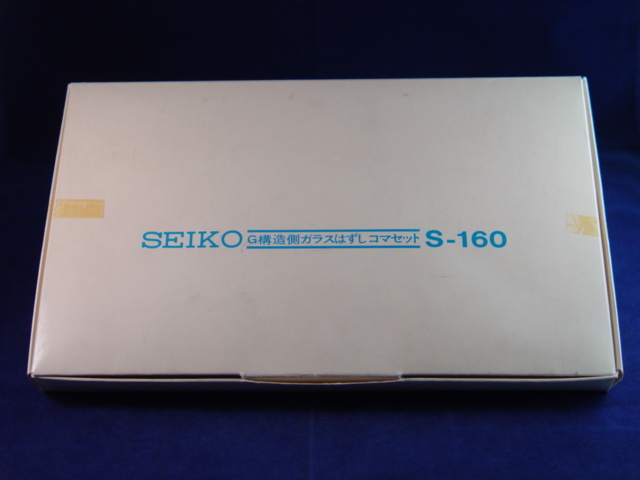 This is a listing of some of the different tools produced by Seiko. This is a series of movement holders for 08QT, 09QZ, 38QT and 41 early quartz calibers. This is a dedicated tool to enable the removal of the winding rotor on 52 series movements. 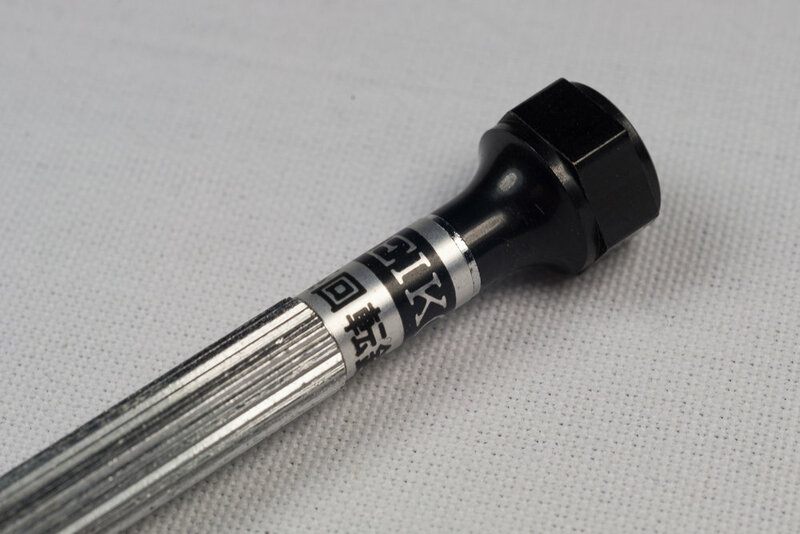 There is a specialised notch in the tip of the tool that fits onto the central rotor securing nut. 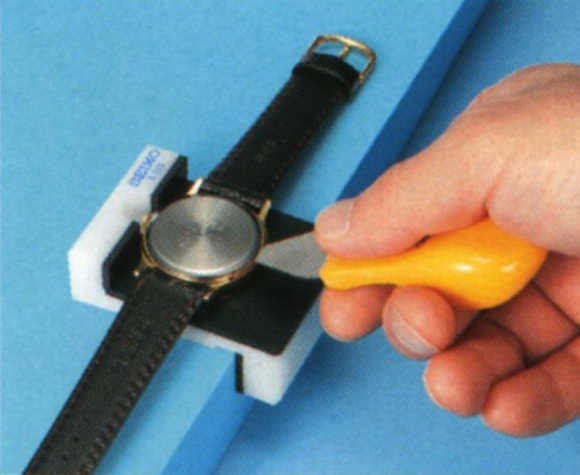 This tool is designed to cut mesh bracelets and watch bands. 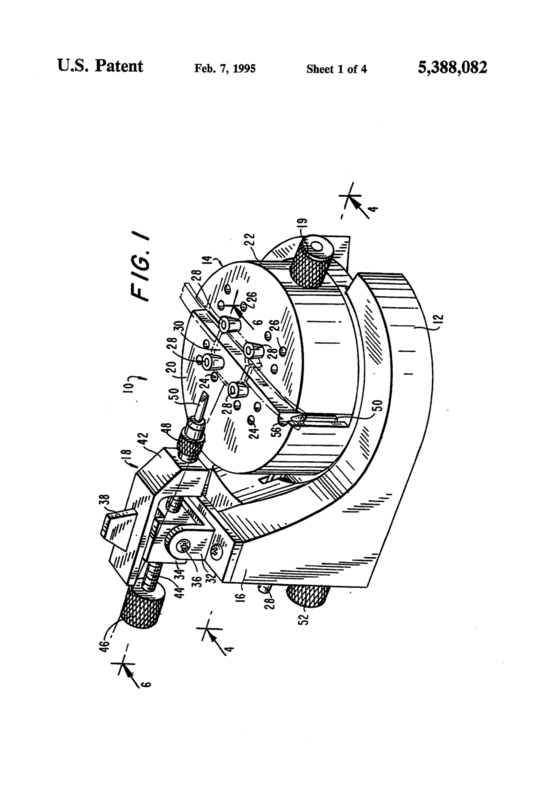 The band is held in place on the top of the tool and a rotating cutting blade is turned with a long lever. 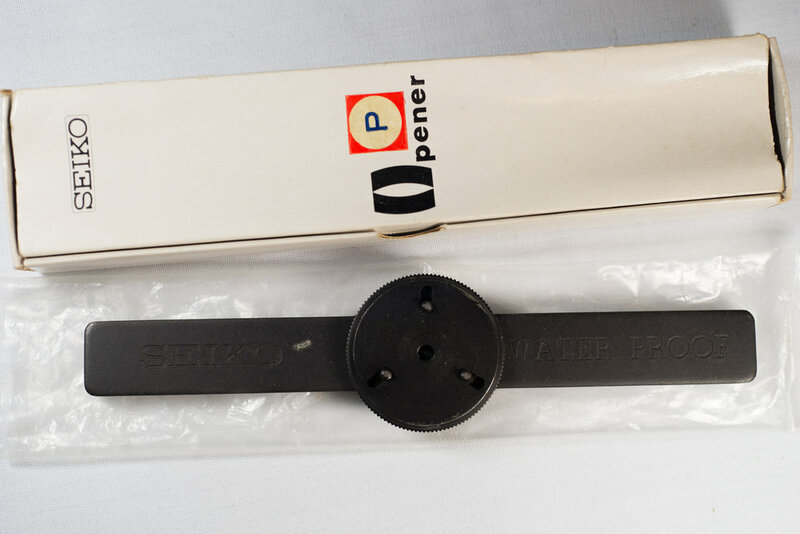 This is a measuring device that has a sequence of different sized sections that can be used to determine the required size of a band or bracelet. The leaf has measuring items from 6mm to 22mm in size. 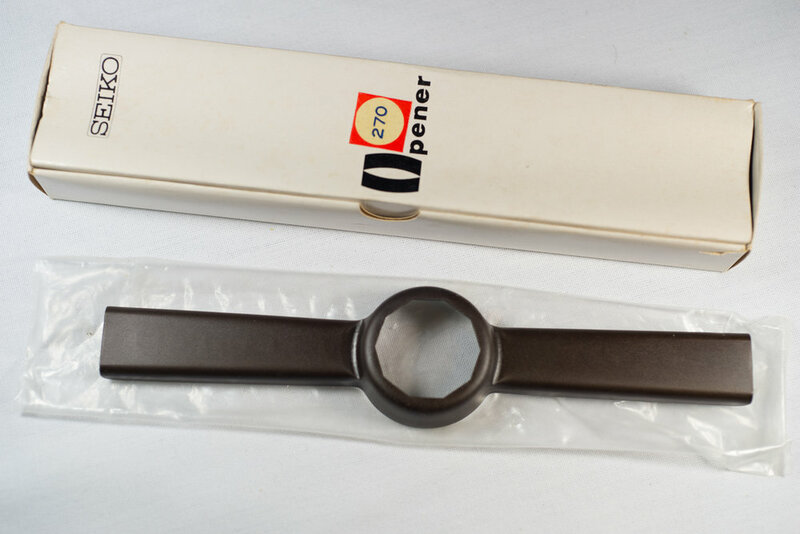 This is a different version of the Band Cutter and works in the same way with a lever operated rotating blade to trim mesh bracelets to the correct length. 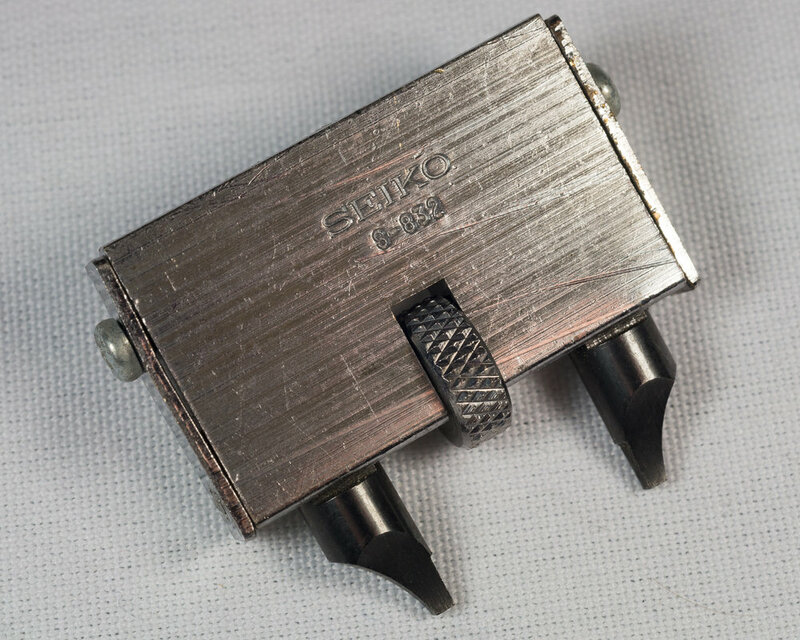 This is a tool designed to open Calibre 37 and 38 battery hatches. The batteries hatches have two notches in them and the tool fits into these recesses and allows the hatch to be rotated. 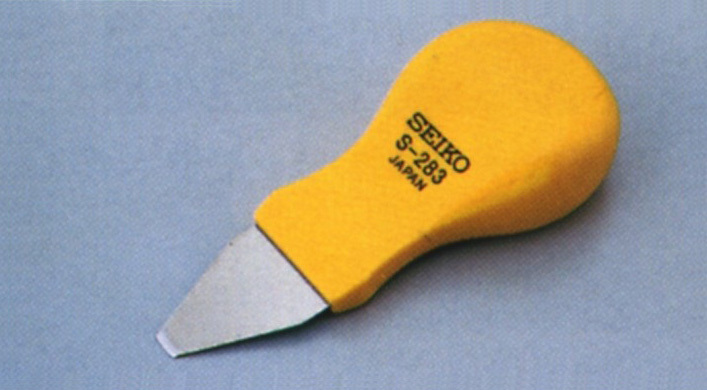 This tool was later replaced by the S-822 that allows a number of different battery hatches to be opened. When working on a caliber a dedicated movement holder allows it to be firmly held in place and correctly supported. 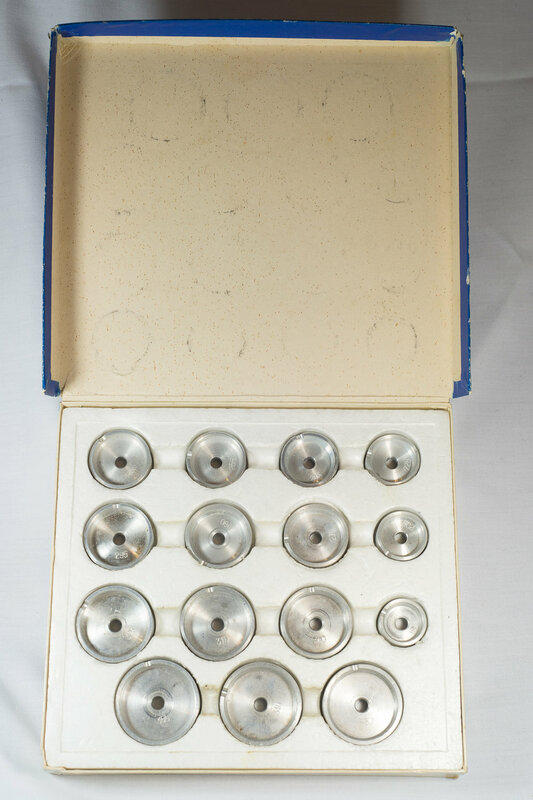 This is a set of 14 different holders suitable for a wide range of different calibers. The QT-99 is a measurement device that allows the accuracy testing of the daily rate for both quartz and mechanical watches. This model is from the late 1970's. The display unit is 0.01 sec./day or 0.1 sec./day (by rounding off the fractions to three or two decimal places. The measuring range is within ±19.99 sec./day or within ±199.9 sec./day. The measured daily rate is displayed in four digits (max.) together with a (+) sign for gain and a (- ) sign for loss. The unit can operate on power from 100V to 240V. 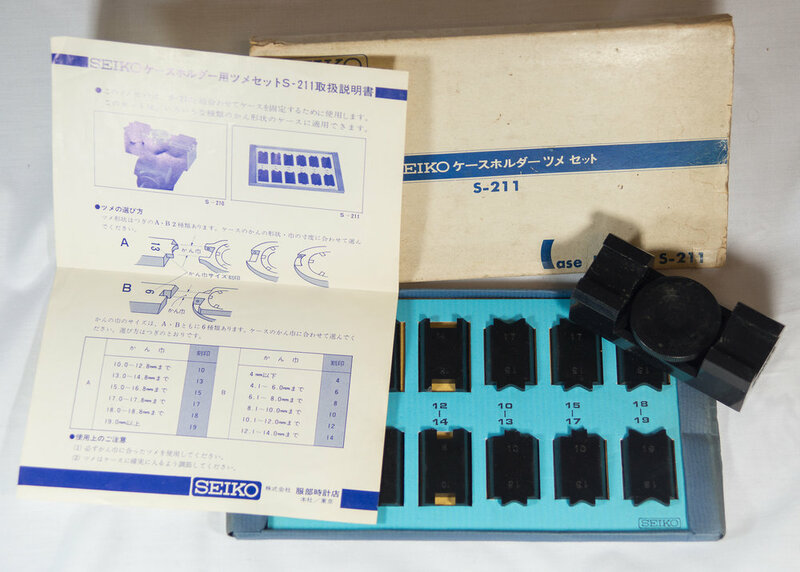 This is a modern quartz tester from Seiko. The rates of quartz watches, twin quartz, annual-equation watches, and other high-precision electronic watches are measured up to a level of 1/1000 sec. 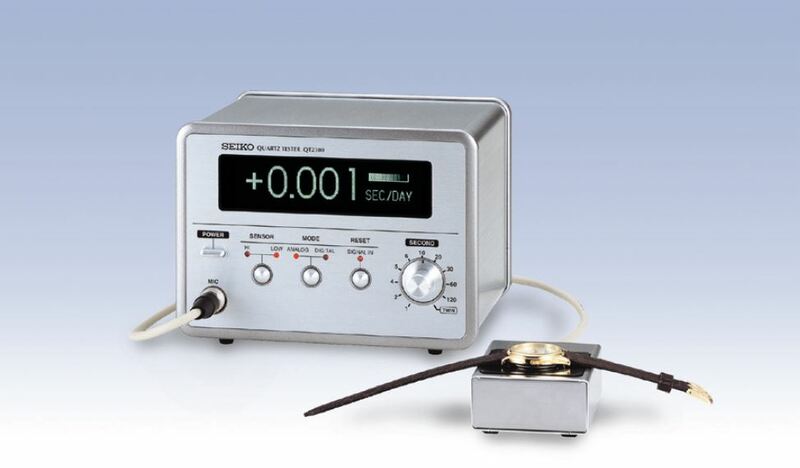 This device can be used with ease because the reference quartz oscillator has an accuracy of 10^8. This is the current quartz tester model that replaced the QT-2300 in 2016. It has the same functionality and operation as the QT-2300, with the same ability to measure up to 1/1000 sec per day accuracy, but is slightly lighter with a body weight of 1.3kg. This is a tool to allow the removal of watch crystals. The set contains four different sized dies that allow a crystal to be slightly compressed to be installed or removed from the watch case. The set contains a white tool that can be screwed down to compress the dies that in-turn compress the crystal. 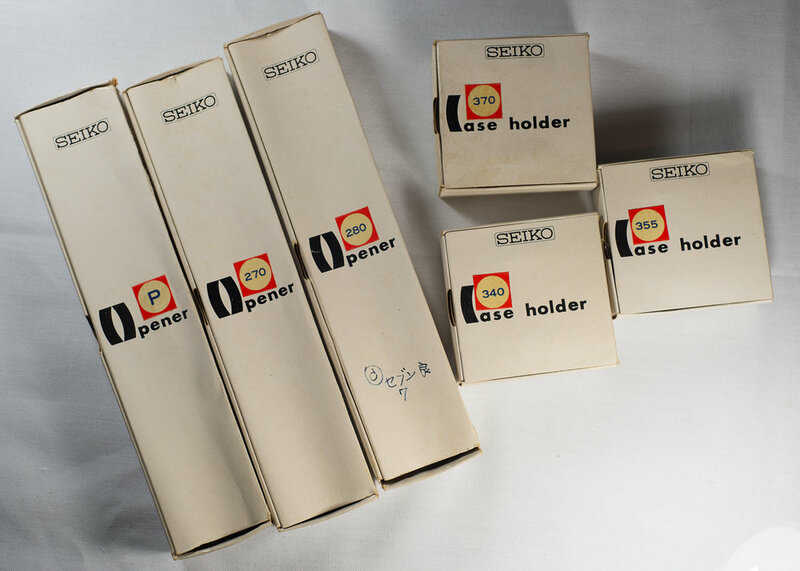 This set is likely from the late 60's to early 70's. This is a tool to allow the removal of crystals from one piece watch cases. The correct sized ring is placed around the watch crystal and then the tool allows it to be slightly compressed and removed from the case. 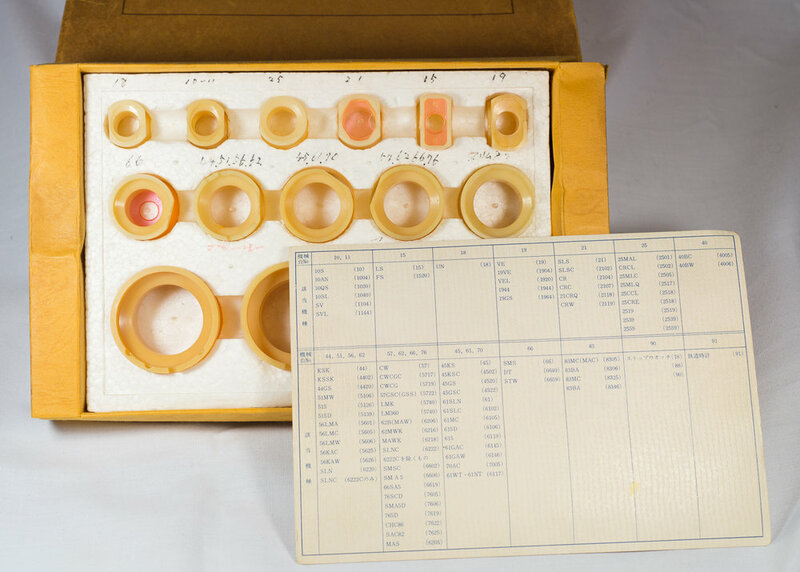 The tool is also used to install the crystals back into the one-piece cases. 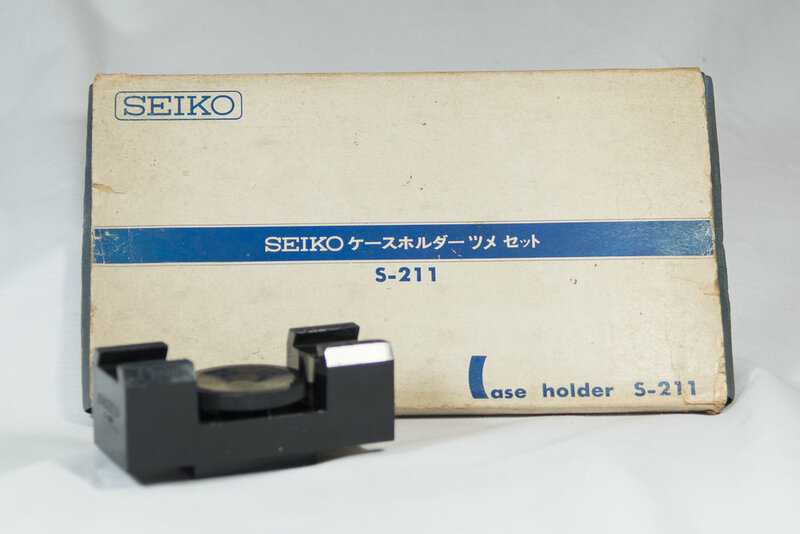 This case opener set, MODEL S-14, is designed to remove and insert the glass of SEIKO watches with one piece cases. 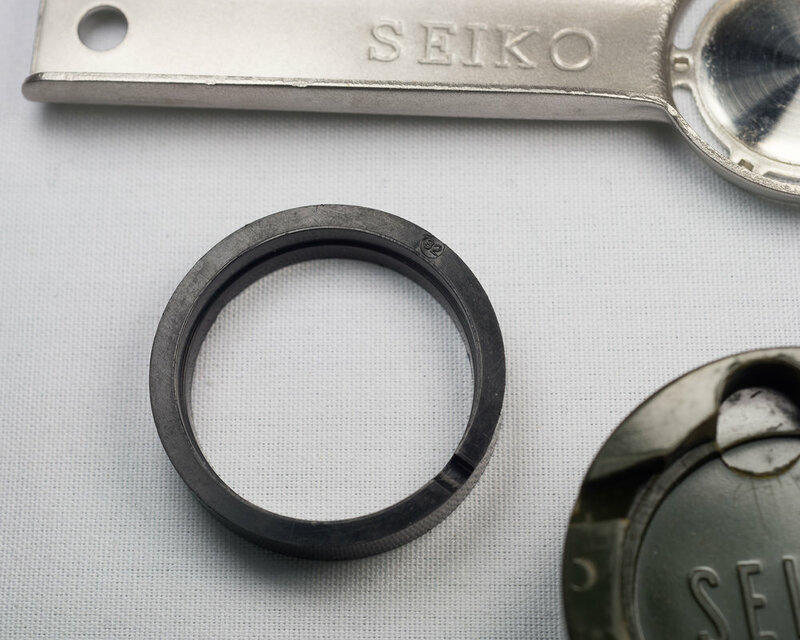 This is an updated version of the S-13 and has a larger selection of rings ranging from 14.5mm to 34.0mm. 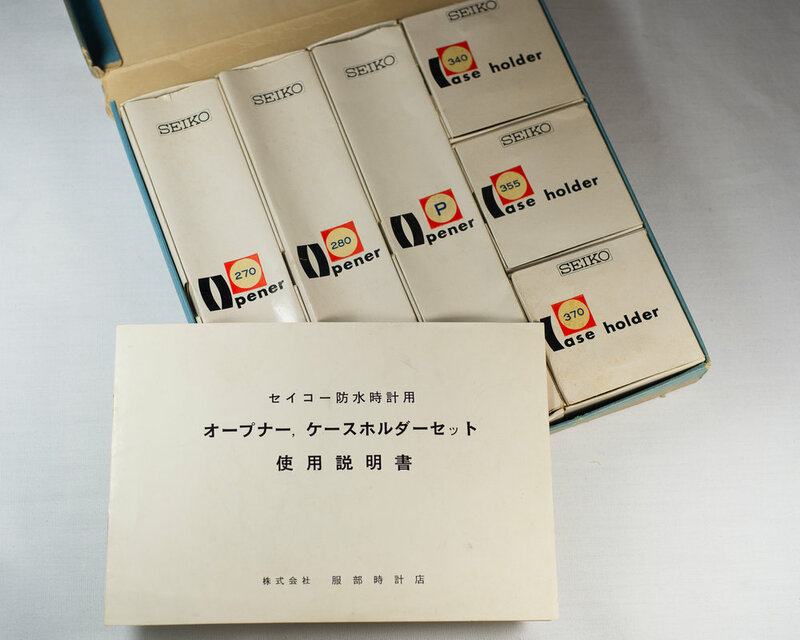 There are also six dies ranging from 14.5mm to 24.5mm. The S-150 is a set four of angled wall dies for installing crystals ranging in size from 28mm to 35mm. 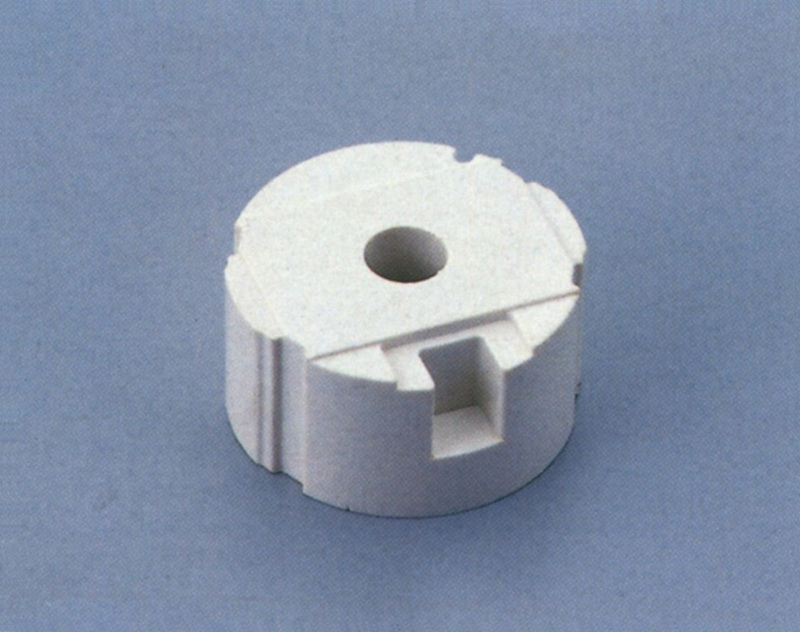 These dies can be used with the S-220 press. 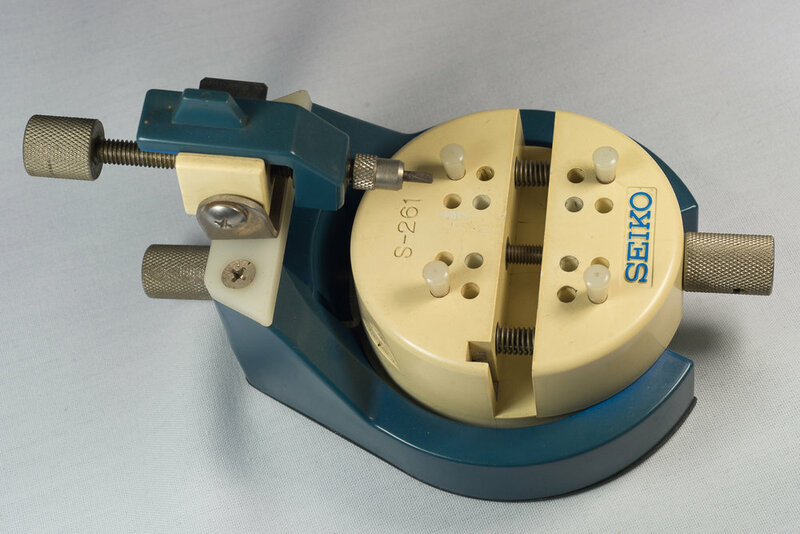 The S-160 is a set of straight walled dies designed to install and remove crystals from watch cases with a G structure design. There have been a coupe of versions of these released with blue or white boxes. The S-170 is a case holder for the ladies ring watch models from the late 1960’s and early 1970’s. 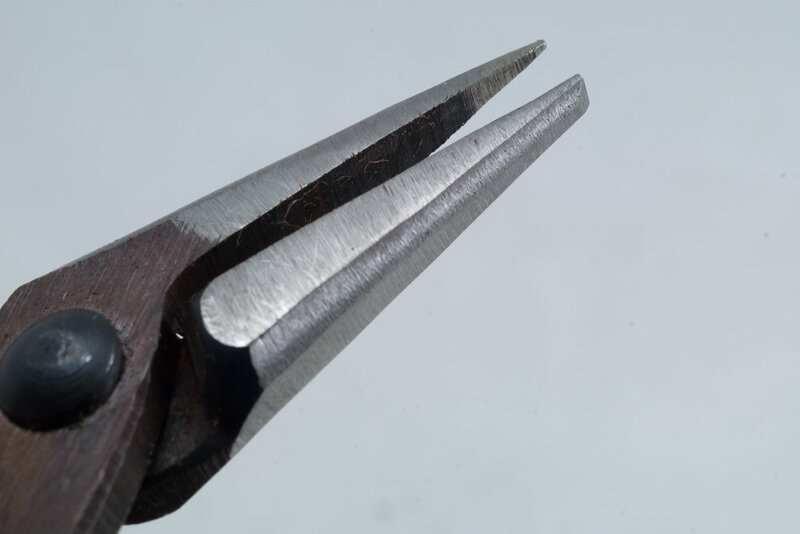 This tool is used to hold the ring watch while working with a crystal press or the S-14 one piece case opener when fitting or removing the crystals on the watch. This is a dedicated die for removing crystals on Alba Spoon model watches. This is designed to fit the uniquely shaped cases and crystals of this watch series. This multi-purpose tool will press fit crystals, bezels, and snap back cases. It will also open and close virtually any style of screw type case, whether it has serrated, flat or notched edges. The kit includes beautifully crafted six draw wooden cabinet containing 71 jigs and dies. 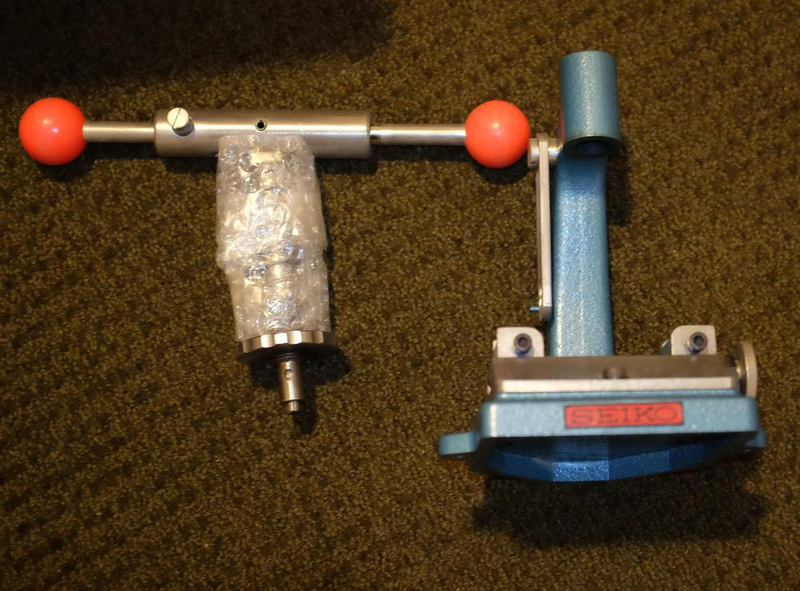 Combination crystal press and master case wrench. The top handle section has even proportioned arms when being used in the master wrench configuration. 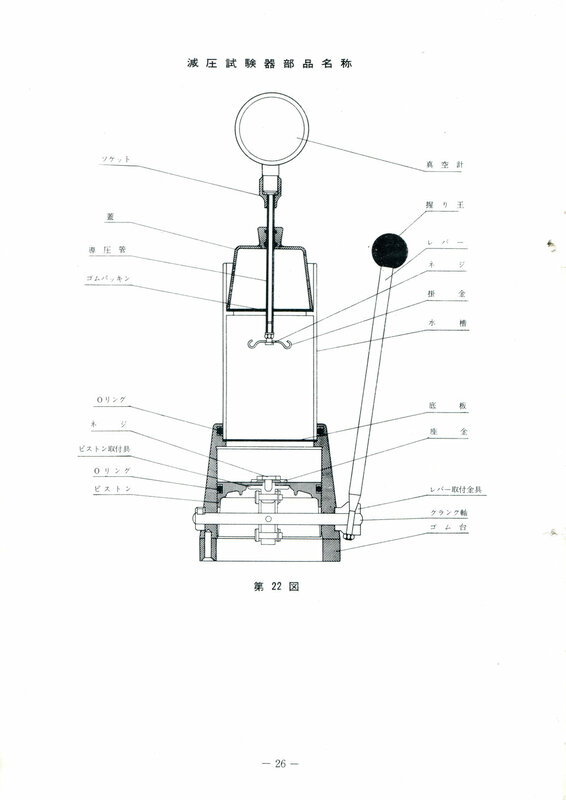 When used as a crystal press one of the handles is exchanged for a longer press arm. The supplied jigs are able to secure the different shaped and sized watch cases while being worked on. 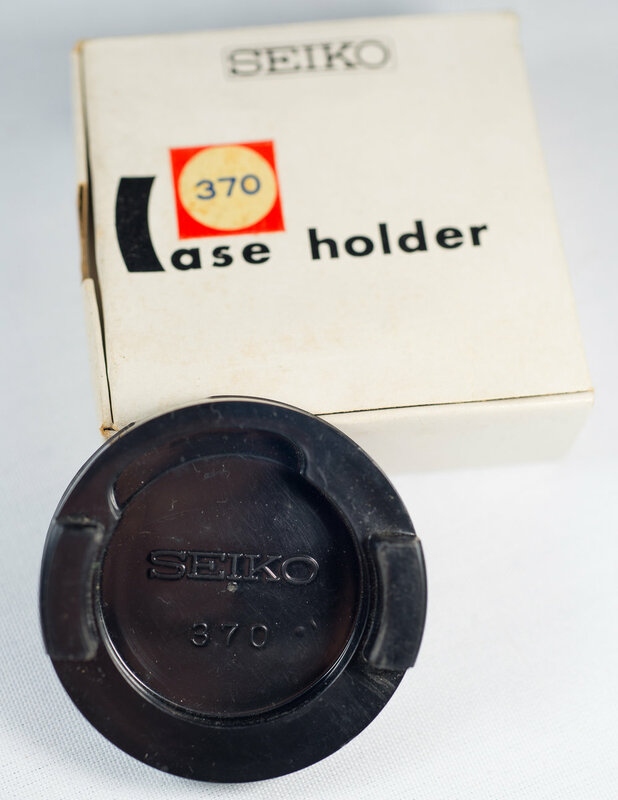 This is a case holder that allows the watch case to be firmly held in place while removing the case back. The S-210 has a solid section at the case that can be firmly clamped into a bench top vice. In the center is a round section on a threaded section that can be raised or lowered to place the case at the correct height. There is a wedge section on each side that allows different sized sections from the S-211 kit to be inserted to fit into the case lugs to prevent the case rotating while opening the case back. The instructions can be found in the S-211 section. 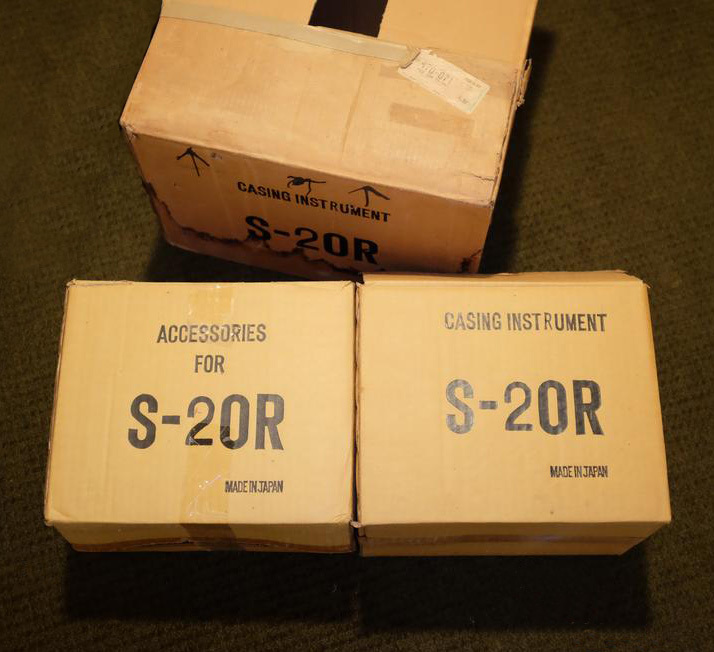 The S-211 is a set of different sized pieces that can be fitted to the S-210 case holder. The set has a series of insert sections that will fit between the case lugs, these are available in 10, 13, 15, 17, 18, 19 mm sizes. There are also a series of pieces that are designed to fit around a central lug of a case. These are available in 4, 6, 8, 10, 12 and 14 mm sizes. This case holder is suitable for many different case shapes as it can be easily adjusted for different requirements. It allows a case to be held without removing the band or bracelet, unlike the S-210. The unit has an anti-slip base so it can be used directly on a bench surface. 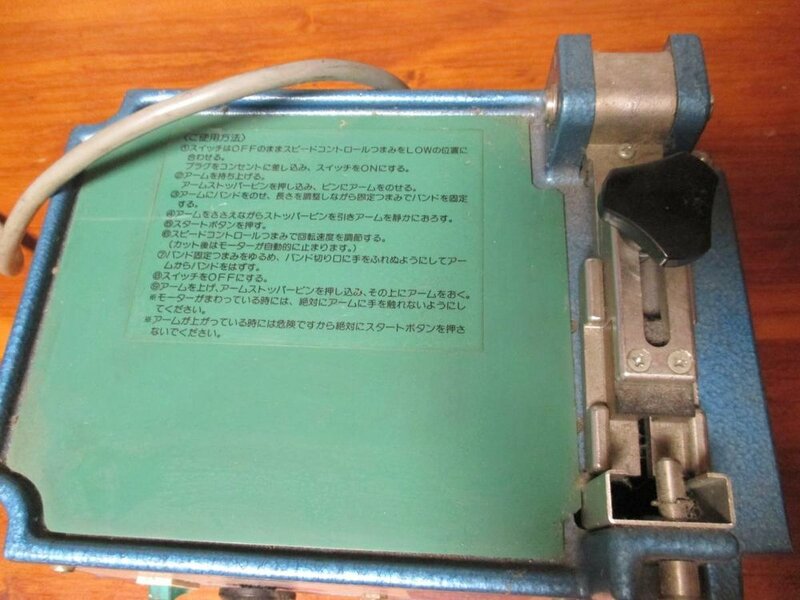 The S-220 is a press that can be used to seat bezels and close cases. There is also a set of fifteen aluminium dies that range in size from 18.0mm to 35.5mm. This can also be used with the S-150 waterproof die set. 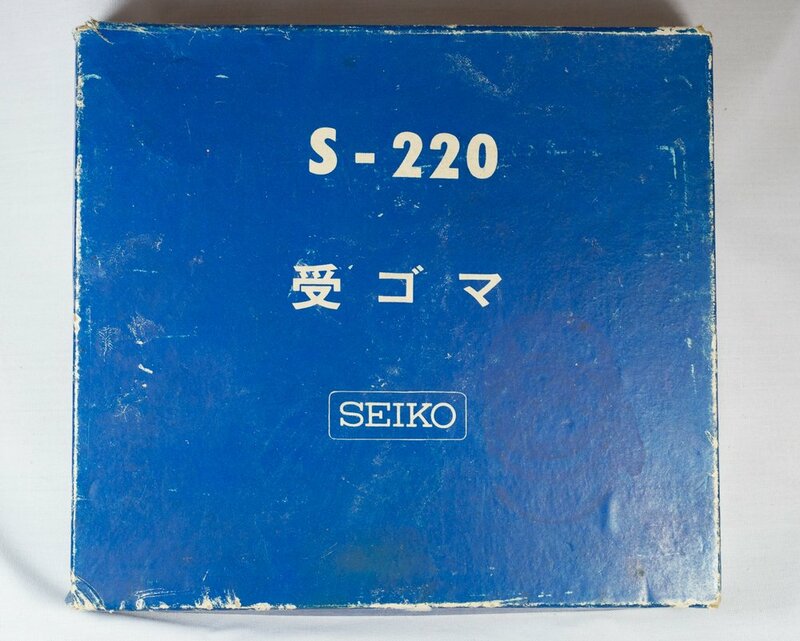 The S-221 is an updated version of the S-220 and can utilize the same die sets. 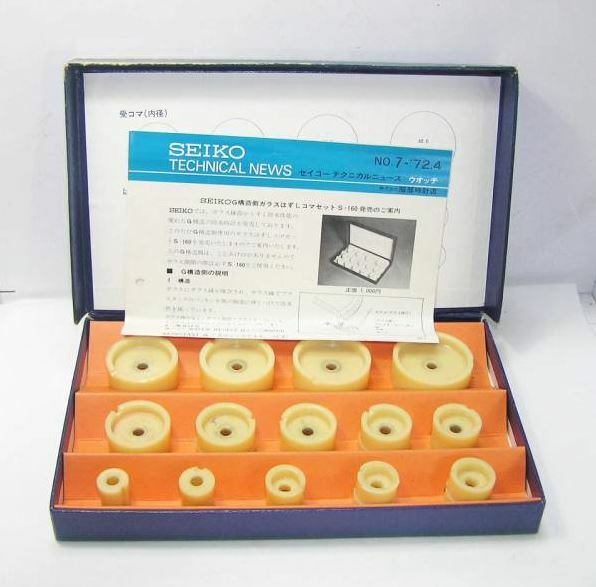 The associated S-221-01 is a set of 15 dies similar to S-220 die set. This is a tool to open snap back cases. The tool has a rotating central platform with a number of different holes that allow pins to be set and grip the watch case. The central jaws on the platform can be opened and closed to securely hold the case in place. The complete platform can then be rotated to align the case opening notch on the case back to tool on the top section. This tool is screwed into the notch on the case. There is a thumb controlled lever on the top that allows the blade to be rotated and pry the case back off. The blades on the top tool can be replaced if damaged. On the back of the tool is storage for a pair of additional case holding pins that can be placed in the central platform. There is also a spare blade holding slot located in the central platform. 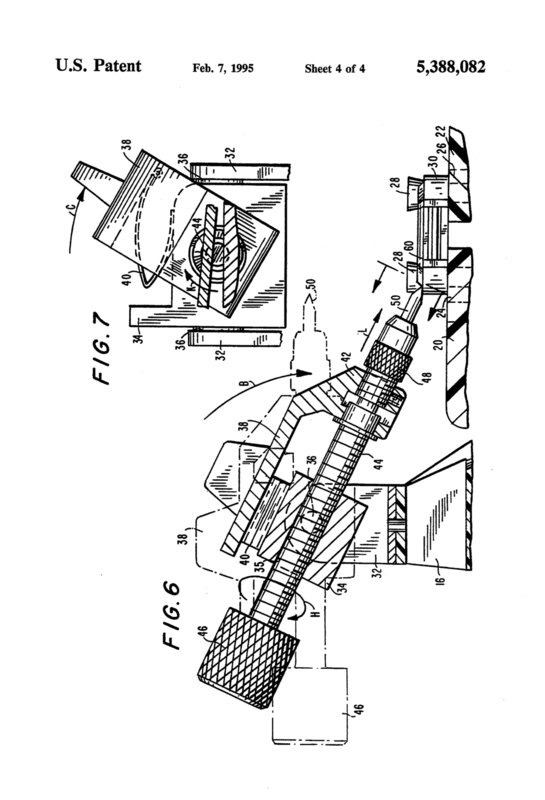 A US patent (5,388,082) was awarded for this tool in February 1995. This is a simple case holder that allows the removal of snap case backs when secured against a work table edge. It has synthetic rubber on the top and bottom surfaces to prevent scratches and slipage. 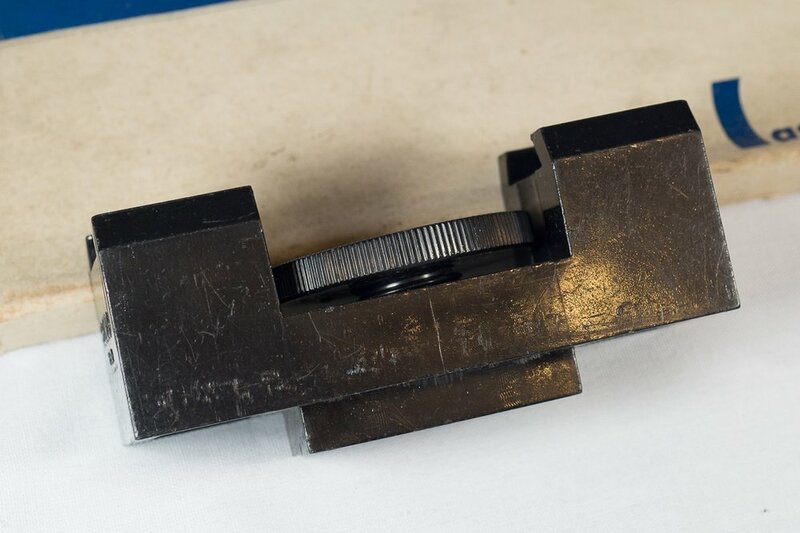 This is a basic case opening tool that is designed to open snap back cases. 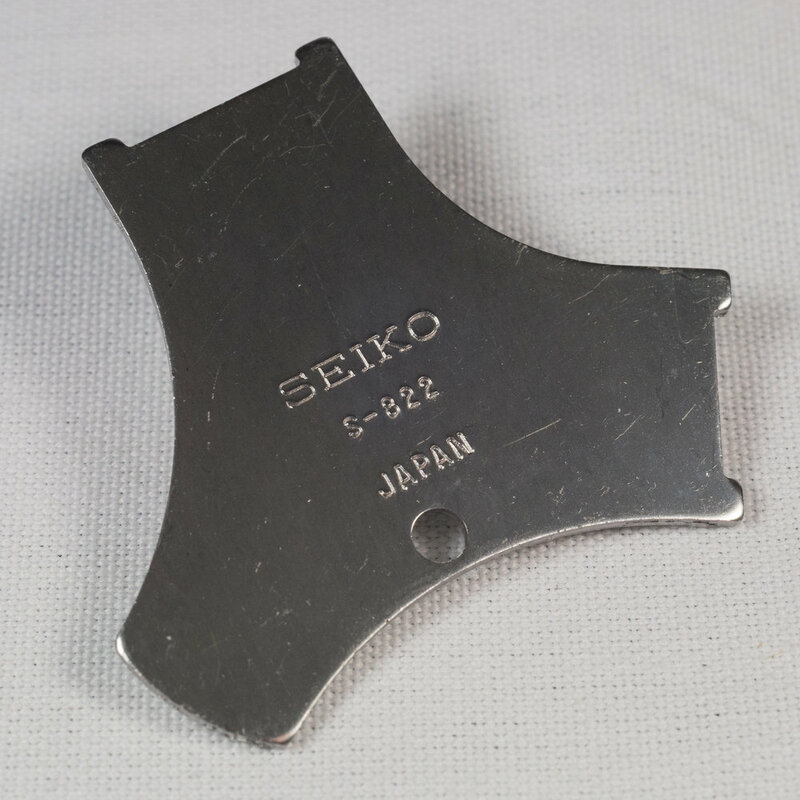 This is a case opening tool with a large blade surface. 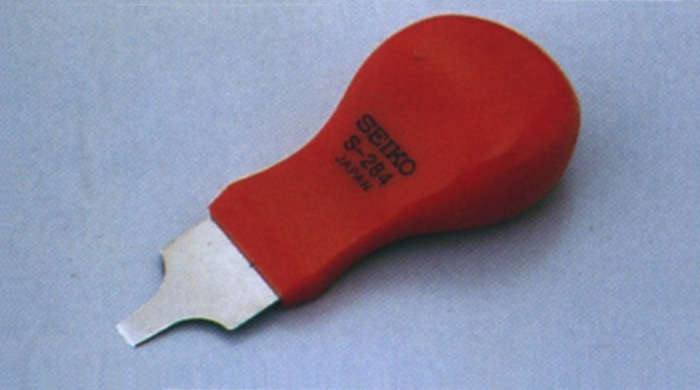 This is a case opening tool with a small blade surface. This is a case opening tool with an extra narrow blade surface. This tool is designed to open two piece cases that are held together in a spring loaded configuration. In between the lugs there are a pair of holes that house a spring that must be simultaneously depressed to allow the two parts of the case to be separated. Grease for mainsprings. After removing the old grease and cleaning a mainspring this is the grease used. This is a two part epoxy adhesive used to glue a crystal into some "non-waterproof" cases. To use mix equal parts from tube A and tube B for approximately 1 minute. When applied it should be left for 12 hours at room temperature to cure and it will fully cure after 24 hours. 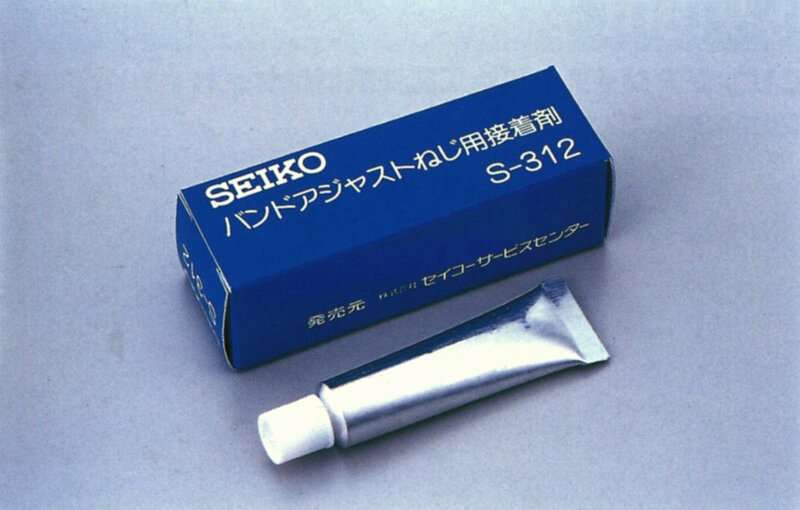 This is a 5 gram tube of silicon based adhesive designed for use on bracelet screws. As it is silicon based it remains flexible even after curing. This is a 10 gram adhesive used to secure watch crystals on some case designs. It is suitable for waterproof watches up to 10 ATM and is cured with a UV light. 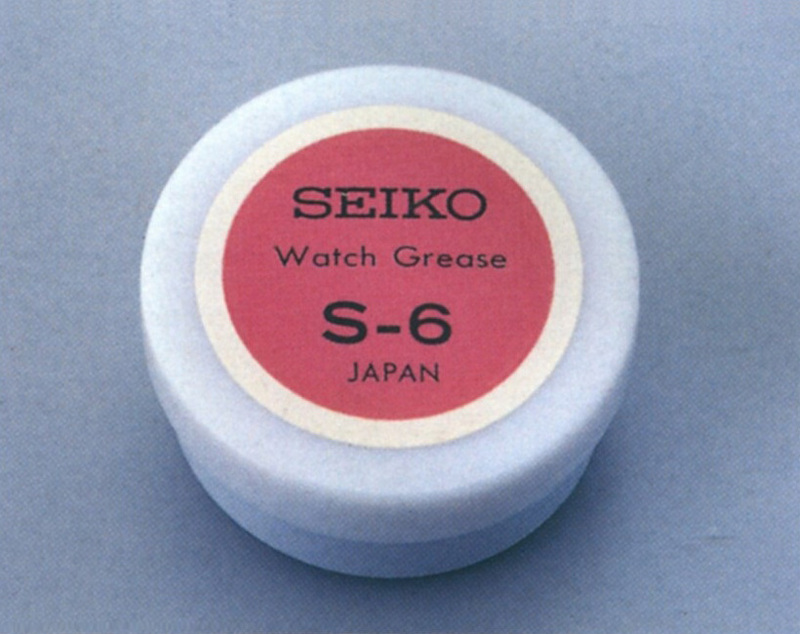 This is a general grease used in watch service. Check the movement service guides for indication where this should be applied. 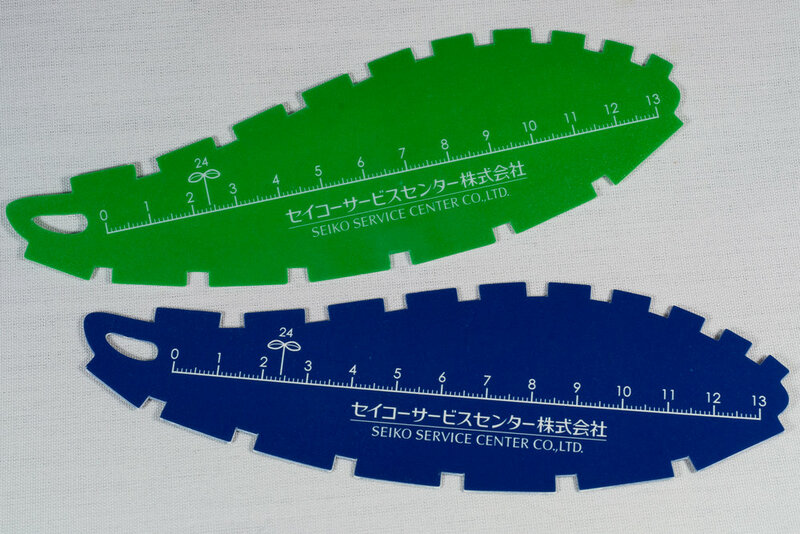 This is a tool to test the waterproofing of a watch after it has been serviced and gaskets replaced. The unit has a carbon dioxide canister that pressurises the chamber. 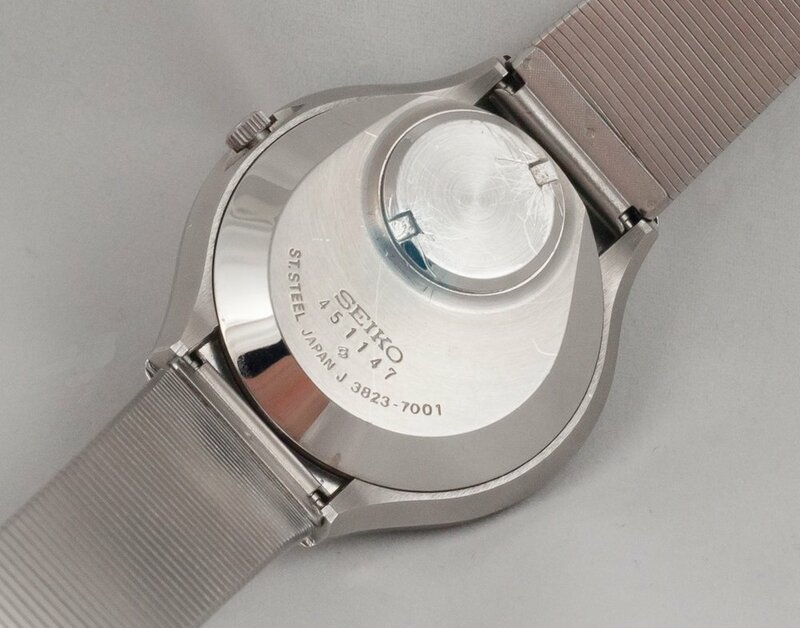 A watch is then submerged into water and you can observe if there are any bubbles emanating from the watch case indicating a leak. This is a movement holder for 6139 chronograph calibres. This allows the movement to be securely held during service and also allows the hand positions to be set. This is a movement holder for 7017 chronograph calibre. This allows the movement to be securely held during service and also allows the hand positions to be set. This tool was distributed in both a blue and white packaging. The S-511 is an updated version of the S-510 that supports both the 7017 and 7018 chronograph calibres. This allows the movement to be securely held during service and also allows the hand positions to be set. This is a movement holder set for working on the perpetual calendar 4F and 8F caliber movements. 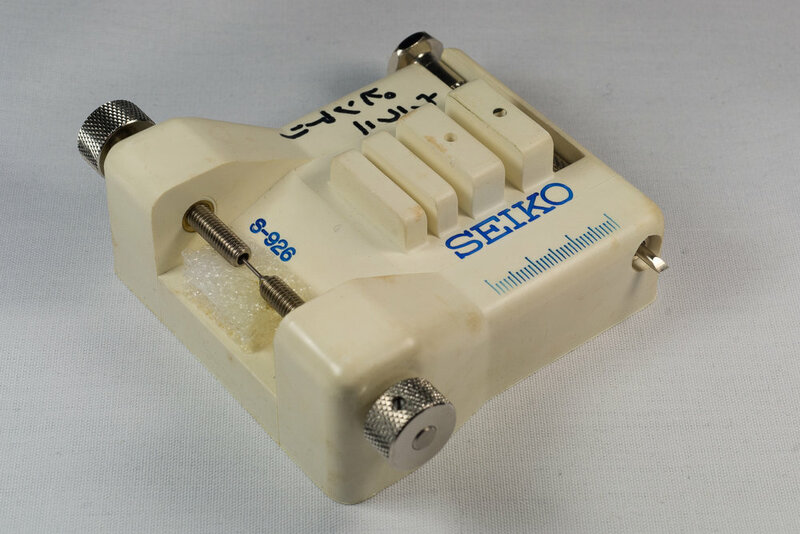 This Universal Movement Holder is made of plastic ensuring it will not to damage a movement, and can be used for repairing any type of movement. 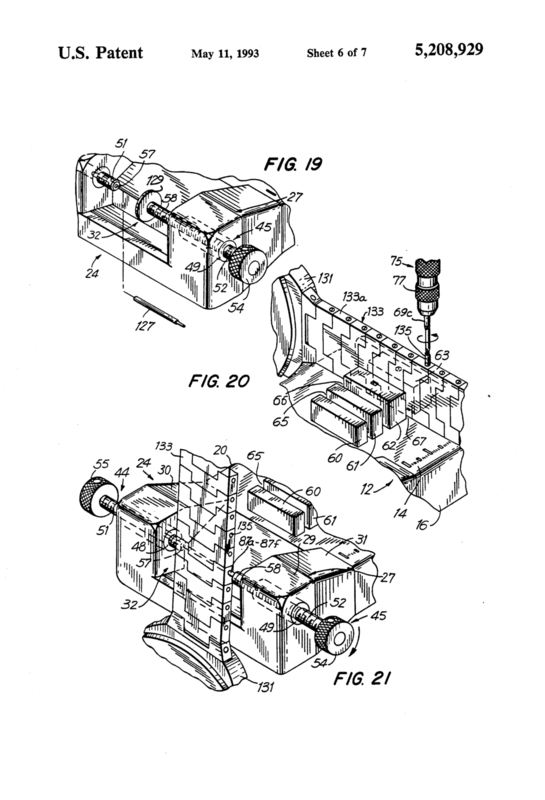 This is a jig used with assembly and disassembly of movements. The conductive rubber surface protects movements from static electricity. This is a jig used with assembly and disassembly of movements. 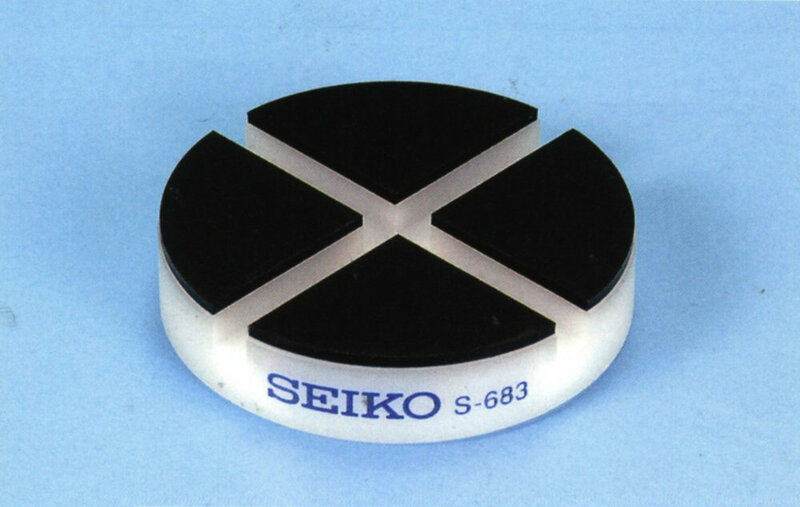 The conductive rubber surface protects movements from static electricity. The square shape makes it easier to turn in any direction. 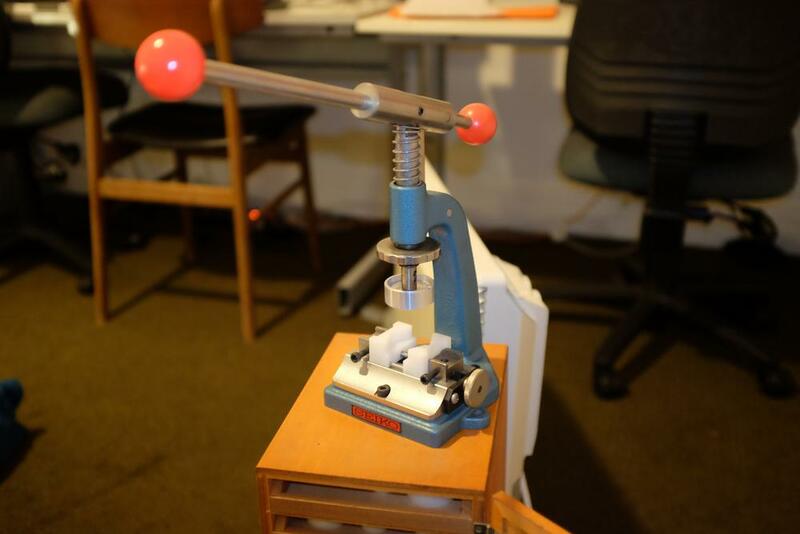 This is a tool that is used for measuring the output torque of the centre wheel and pinion on various early quartz movements. 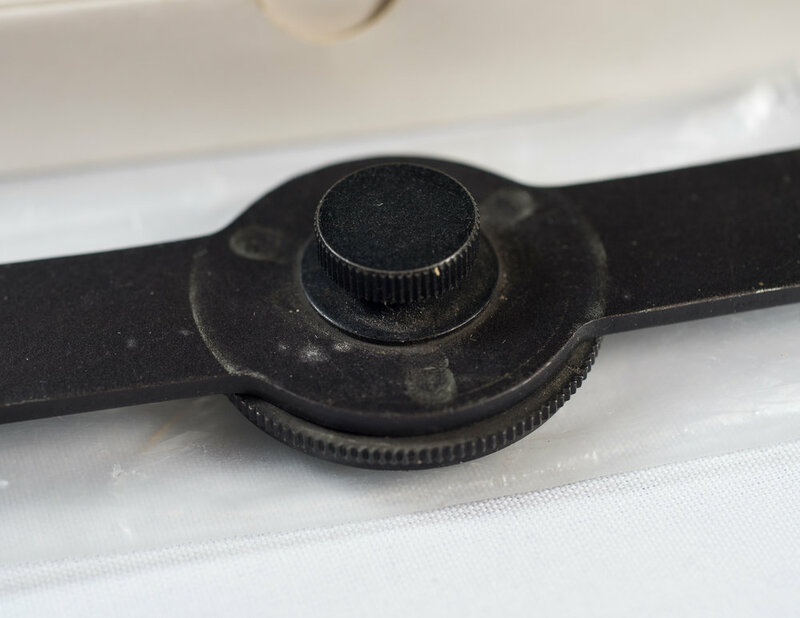 To operate this tool the watch being tested is placed in a movement holder and then located in the notch in front of the measuring arm. 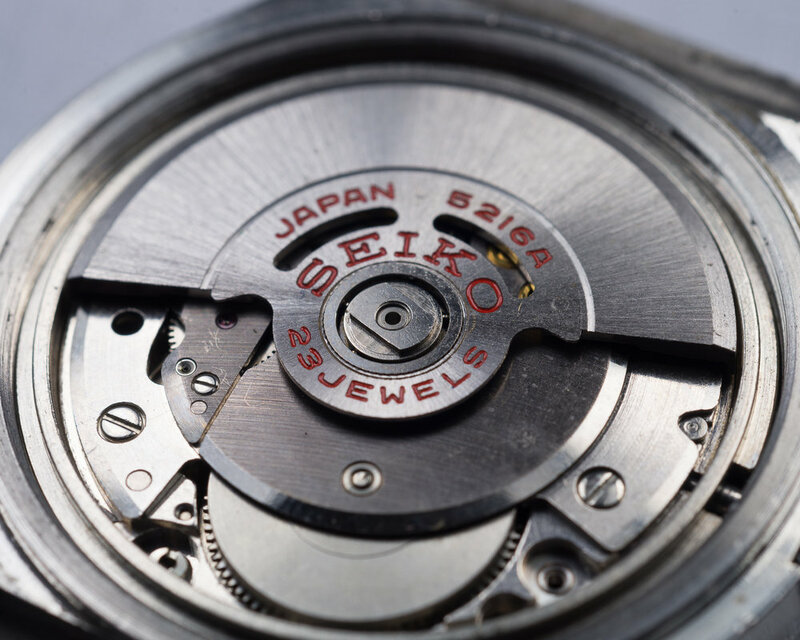 A specialised set of hands (second hand 7-8mm & minute hand >12mm) are fitted to the movement. The watch is put int the time setting position and the minute hand adjusted to rest against the gauge. The watch is then operated and the gauge read once the second hand has stopped moving. This is a battery hatch removal tool. 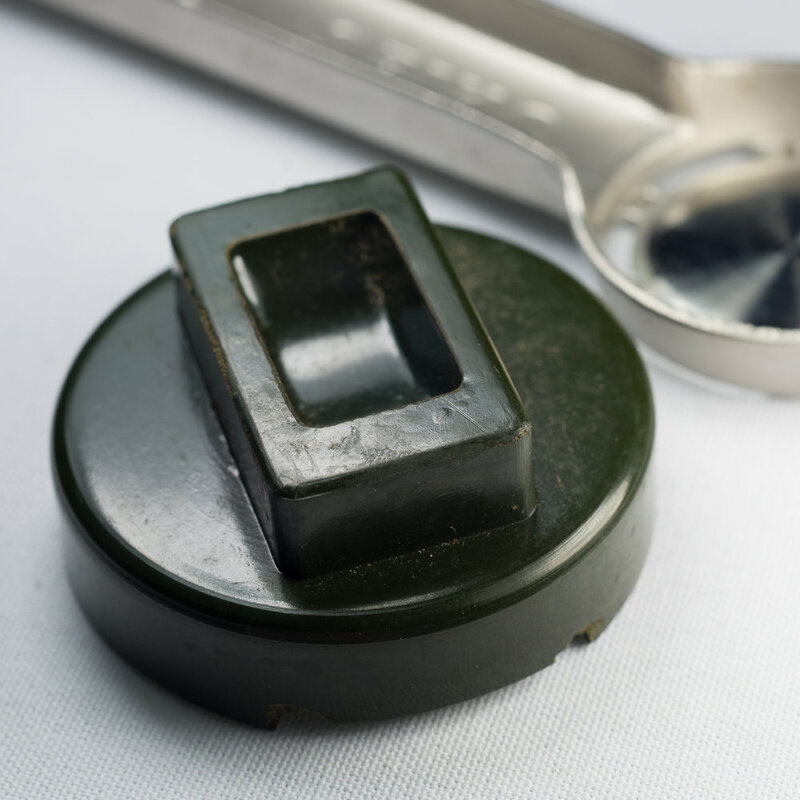 The different sized ends are used to open different shaped battery hatches. 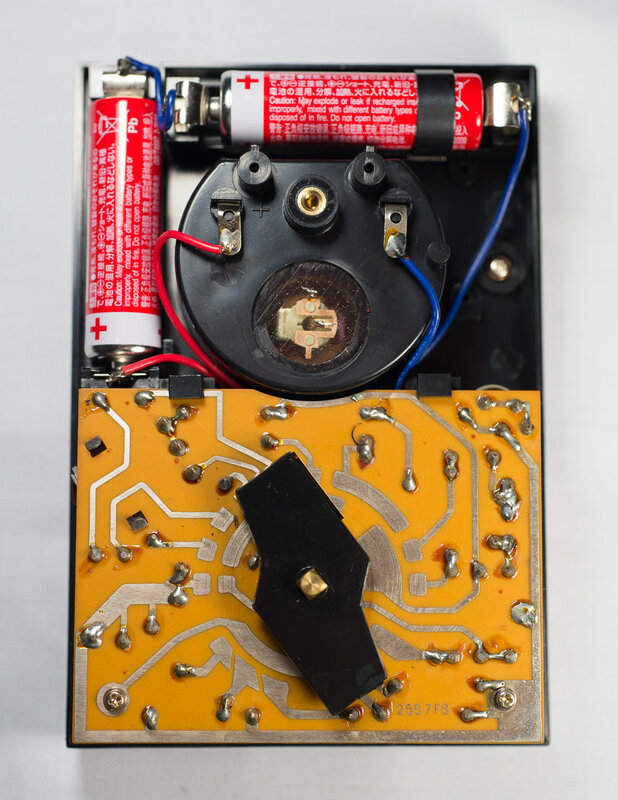 This is an analog multi-meter designed to check the voltages, current consumption and connectivity of electronic watches and clocks. This is an adjustable two prong case opener for screw case back opening. This has a maximum opening distance of 20mm so is suitable for ladies watch cases. This jig allows a battery to be externally mounted and then power applied to a movement through a pair of probes. This is useful for working on a quartz watch when the battery can not be held in place via the usual method. The S-840 is a digital multi-meter designed to work on quartz movements. You are able to measure current consumption, connectivity and voltages. This is an accessory for the S-840 multi tester. 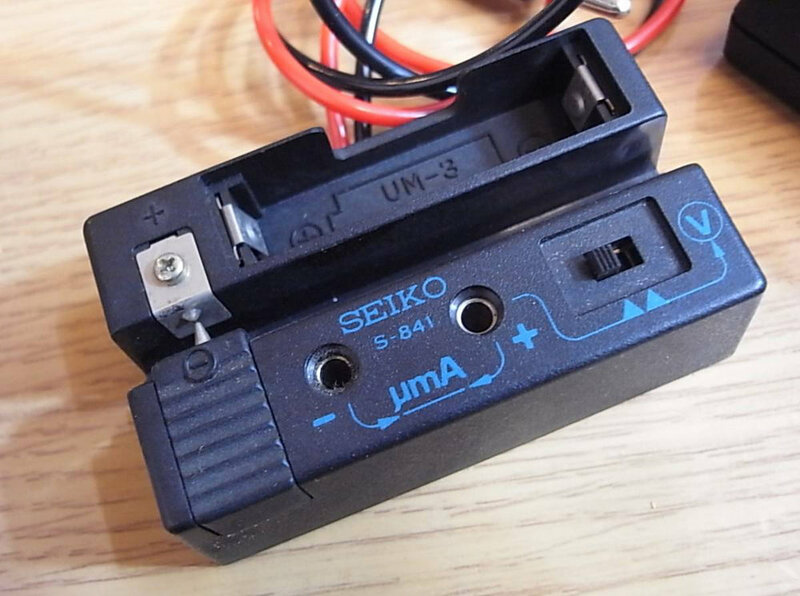 It allows the testing of button batteries by placing them in a spring loaded slot section. It is also possible to use this as a current supplier when testing the power consumption of a watch circuit. There is a switch to the side that changes between battery test and power supply modes. These are a pair of probe cables that can be attached to the S-860 digital multi-meter to allow connection and measurement of different movements. 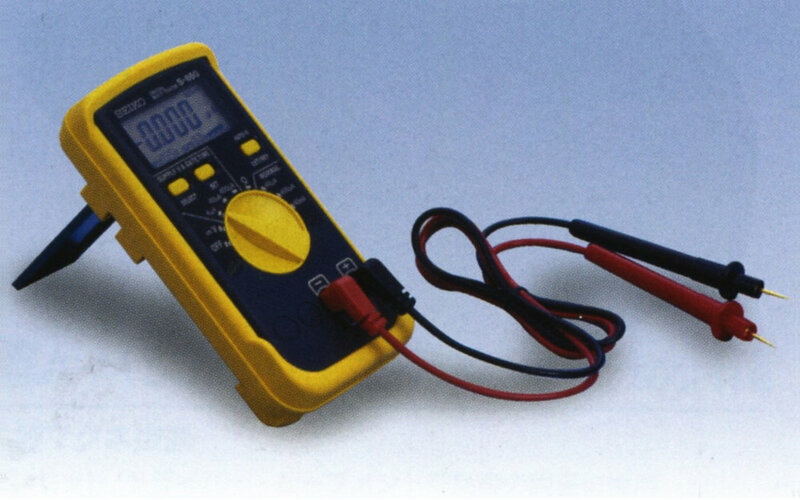 This is a simple battery tester that shows the voltage of a battery. The battery to be tested is placed on the metal disc and the probe touched to the negative side of the battery. The digital display shows the voltage the battery produces. 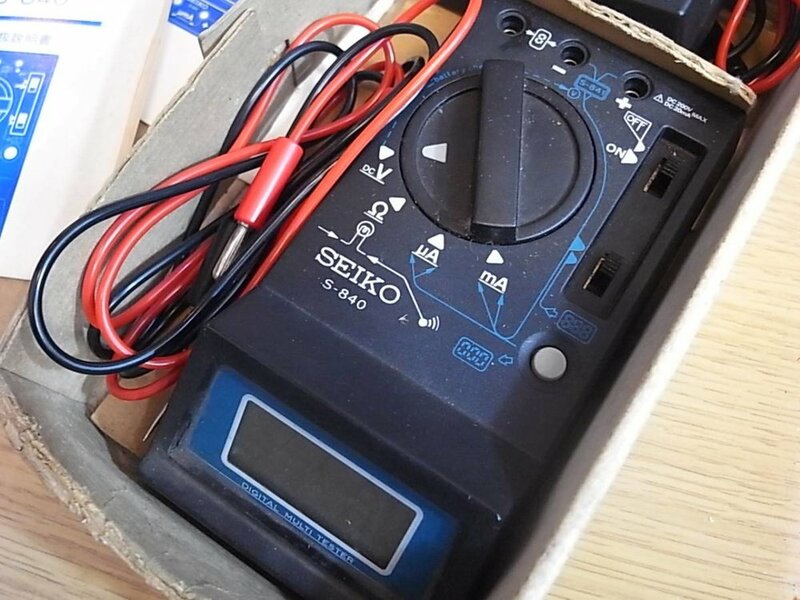 This is a multi tester developed specifically for watch repair. It can measure current consumption of watch / circuit, coil resistance and battery voltage measurement. It allows measuring of the current consumption according to hand movement of the watch and by setting the gate time, it is possible to measure more accurately. There is a built-in power supply can can provide voltage from 1.55V to 3.0V. By adopting the time integration method, it can measure accurately up to 1/100 μA. It can measure up to 1/1000 μA in the case of a constant low current like a single circuit block. It has an auto range function that automatically switches the measurement range. An auto off function prevents battery exhaustion if not used it in about 20 minutes. The auto hold function (voltage measurement · resistance measurement) keeps the measured value when a button is depressed. The unit also has the applicable EMC compliant standards and obtained "CE marking". These are generic finger cots used to protect movements and parts when working on watches. They are relatively thick and are reusable. 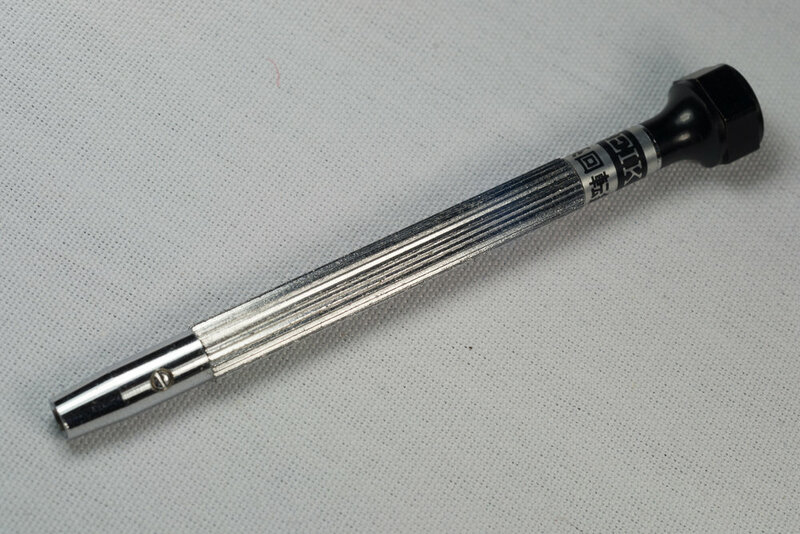 This is a dedicated battery removal tool designed for the 4F and 8F perpetual calendar calibers. 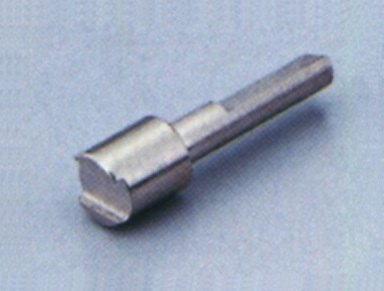 This is a screwdriver for band adjustment used to loosen and tighten the bracelet adjustment screws. It has a thick handle so that it can be easily turned even with a difficult screw. 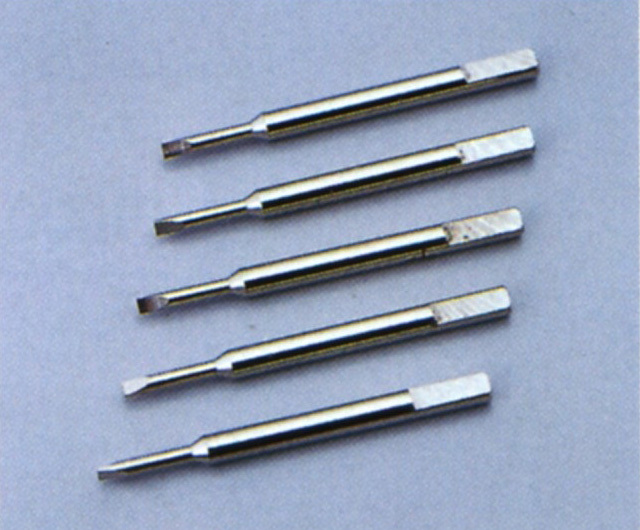 The screwdriver blades are replaceable and a set of five replacement blades is provided with part S-914-01. This is a dedicated tool piece that is designed to remove the central screw of the automatic rotor on 4S caliber movements. This unit fits into the S-914 screwdriver. The S-915 is designed to allow easy adjustment of a wide range of watch bracelets. The set comes with a couple of screwdrivers with interchangeable bits both flat blades and rounded probes. There is also a large weighted base that has a special bit that is placed in it. This base holds the bit upright to make it easier to insert into the bracelet being adjusted. 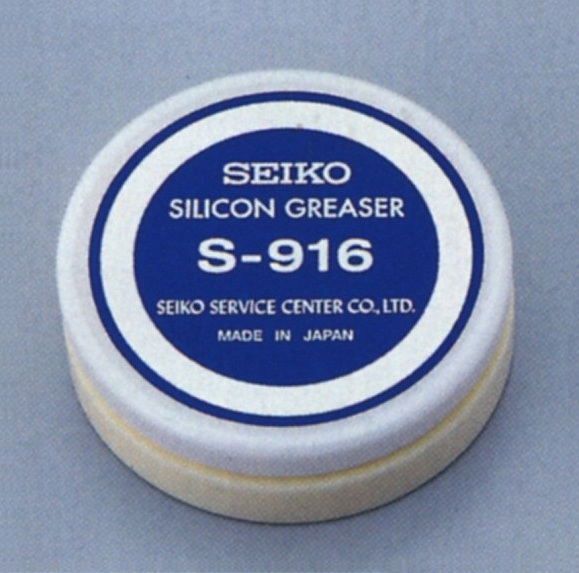 Used to apply silicon grease onto gaskets. The case opens and there is an applicator that allows the even coating of silicon grease to be applied. 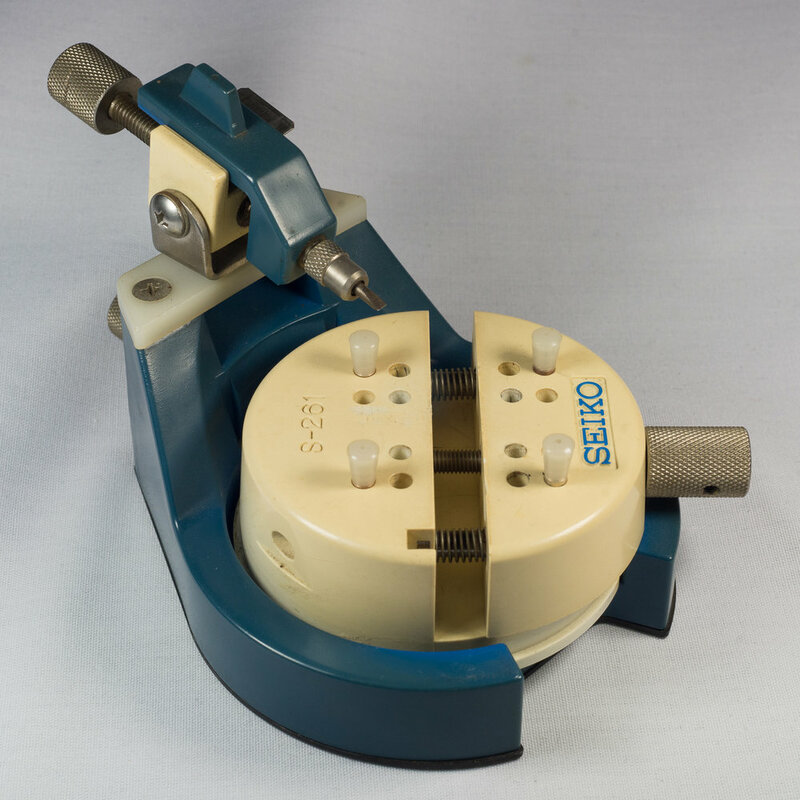 The S-917 Bracelet Cutter is a power tool used to size a number of bracelet styles like mesh that do not have individually sized links. The watch owners wrist is measured and then the bracelet is cut to size. 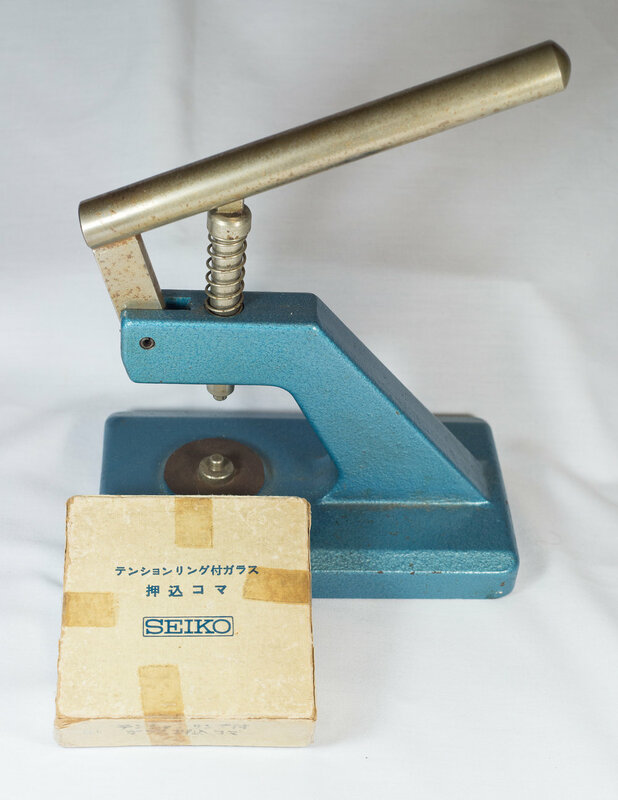 This is a similar to the mechanical guillotine style cutters but instead employs a motor driven cutting wheel. This is a tool designed for the removal and fitting of band securing pins that are held in place with the C ring type, pipe type and pin types. 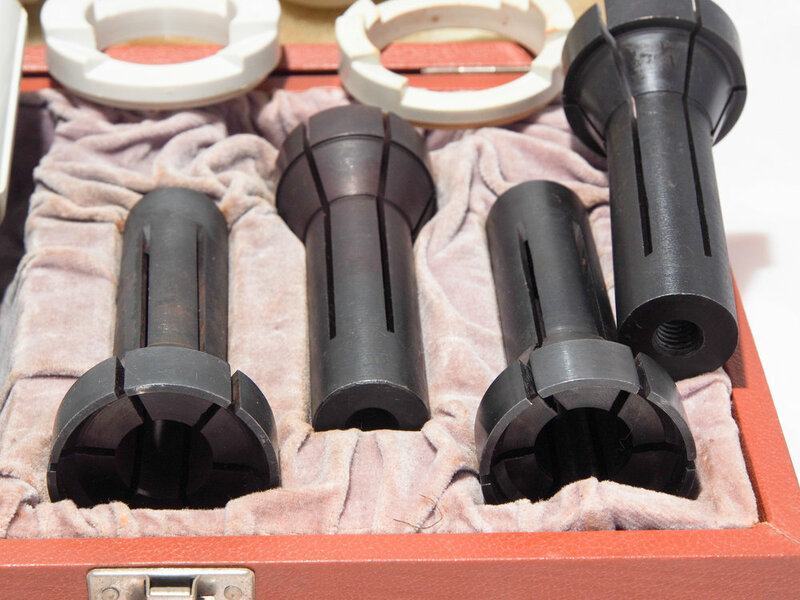 A set of replacement tool tips is available in set S-91801. This set of pliers designed to remove the securing clips on the size adjustment sections of some bracelets. The pliers have one side of the jaws with a wide flat surface and the other side with a slightly longer pointed tip. The flat side is placed on the outer edge of the bracelet and the thin pointed tip is inserted into the clip to remove it. 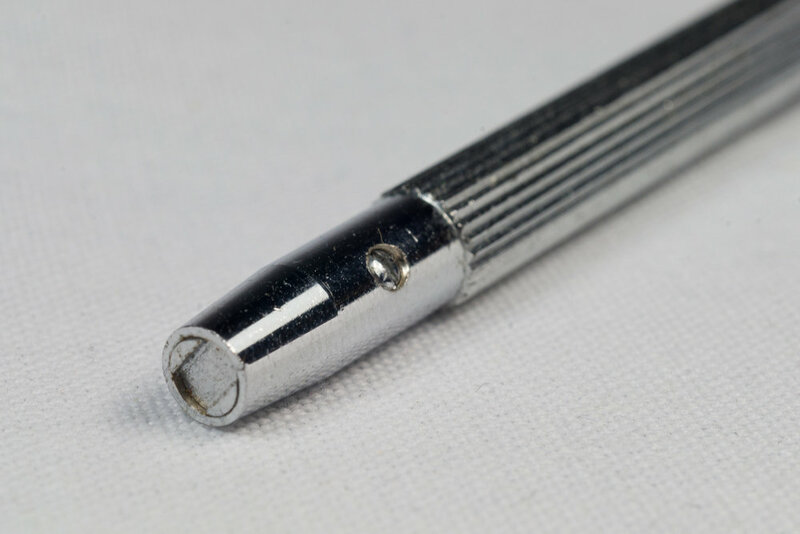 This is a Phillips Head (+) Screwdriver 0.98MM used to remove some case backs with individual securing screws. 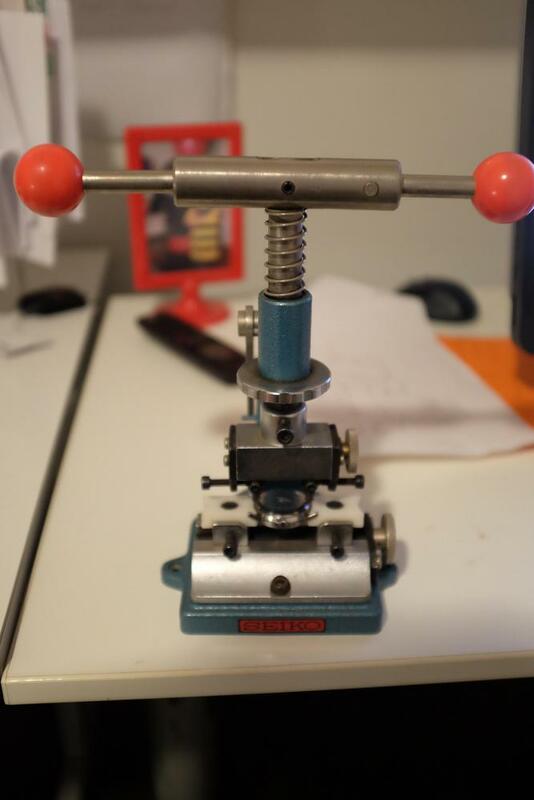 This is a tool that allows for the resizing of multiple types of bracelets. This has the same capabilities as the S-918 tool and a number of other features. The unit has storage for a range of tips in the base of the unit. There is also a holder for a screwdriver at the end of the tool. This screwdriver appears to be a S-914. 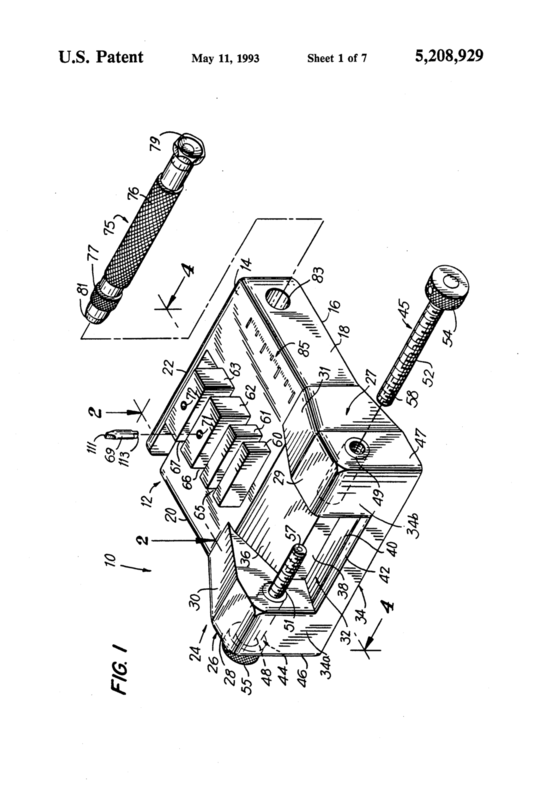 This tool was awarded US patent 5,208,929 in 1993. 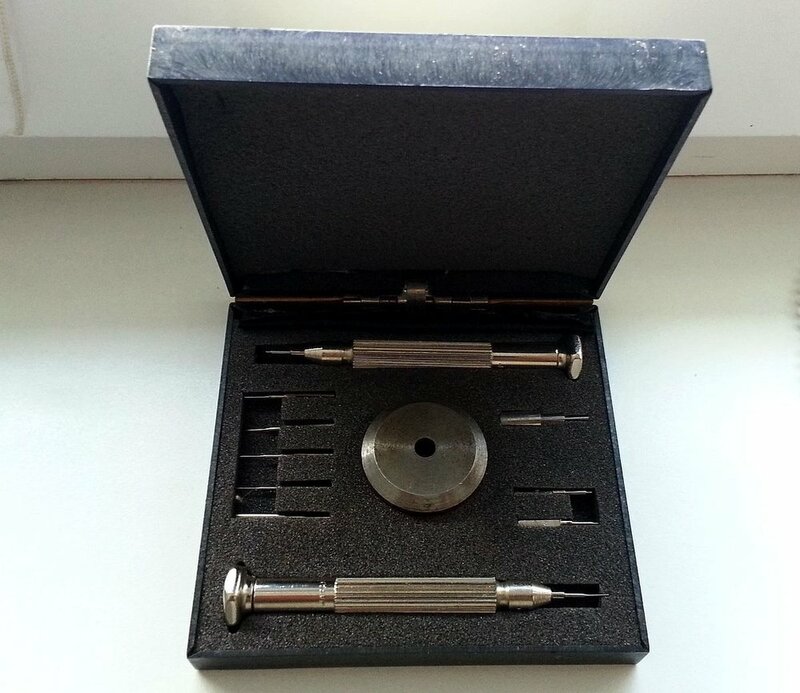 A replacement set of 3 pin staking bits and 3 collar bits are suppled with S-92601 and a set of 3 screwdriver blades are available in set S-92602. This tool is designed to resize the S shaped expandable bracelets. 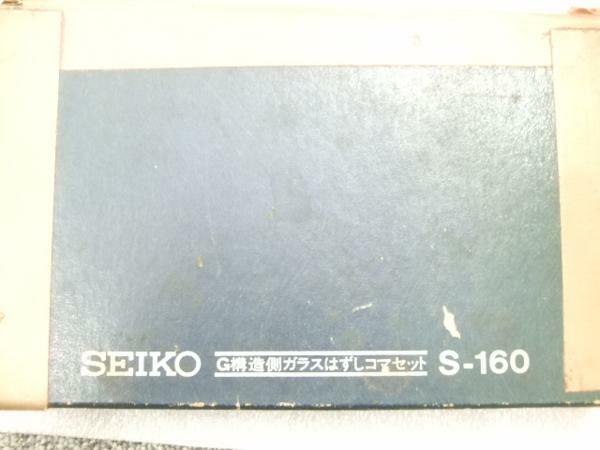 Not strictly a tool but this device allows the charging of Seiko kinetic movements. If a capacitor is low on power or needs to be fully charged it can be placed on the charging plate and in around four hours can be fully charged. The unit comes with a power supply that can accept voltages between 100-240V AC. It has a figure 8 power connector on the charger so is able to be easily adapted to the local power requirements. To use this device you align the watch crown with the marking on the central charger that matches the movement type. Then the red button is depressed and the watch is charged. There is a switch on the side of the unit that changes the charge time between 30 minutes for a top up of power or 3.5 hours for a full charge. 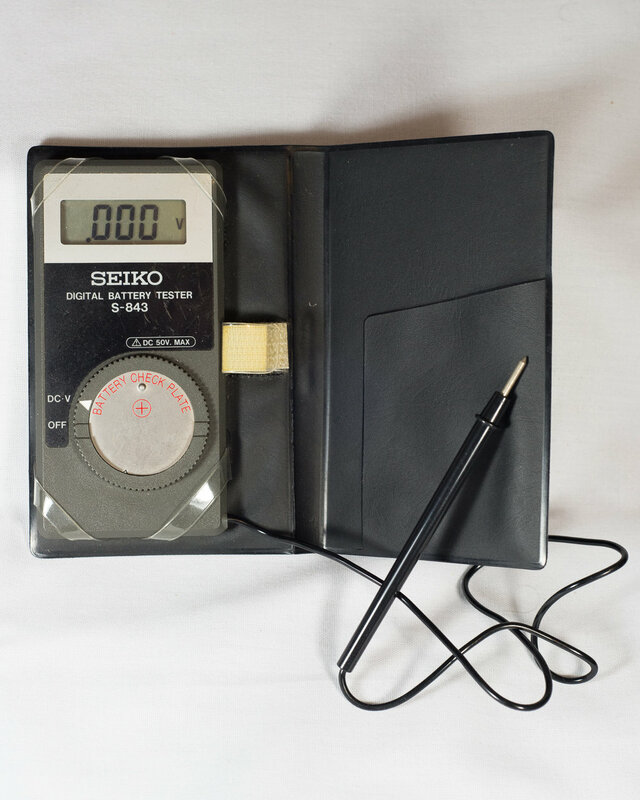 The SD-6 vacuum tester allows the testing of waterproof watches after service. The watch is held on a bracket and the air pressure inside the tester is reduced with the handle on the side. A gauge at the top of the tool indicates the internal pressure. The watch is then submerged in water and checked for bubbles emitting from the case indicating a leak. 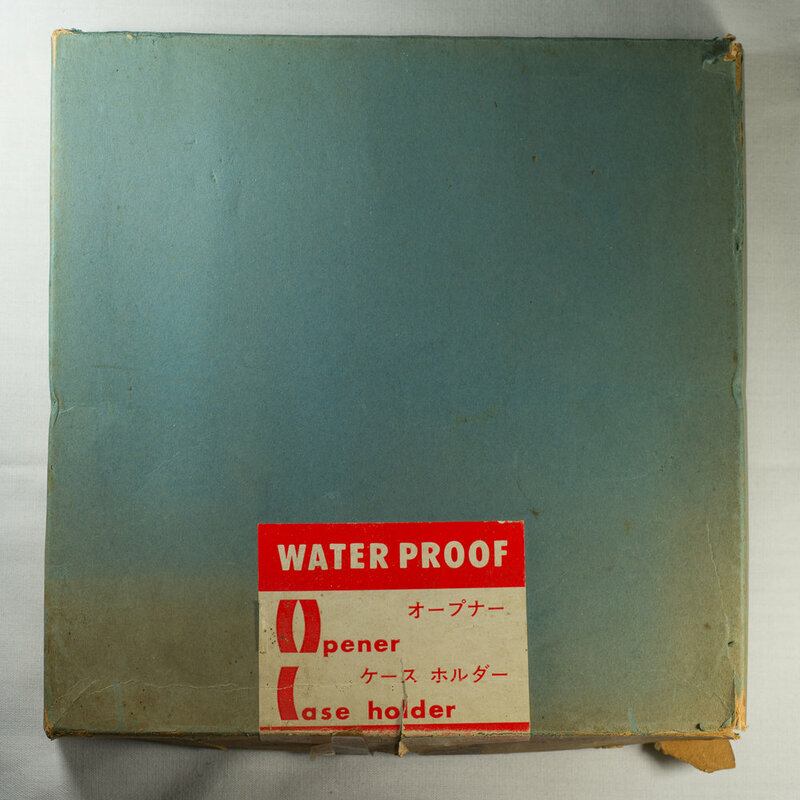 The tool was released in the 1960's and can be seen in the 1963 Seiko Technology Notebook discussing waterproof watches. 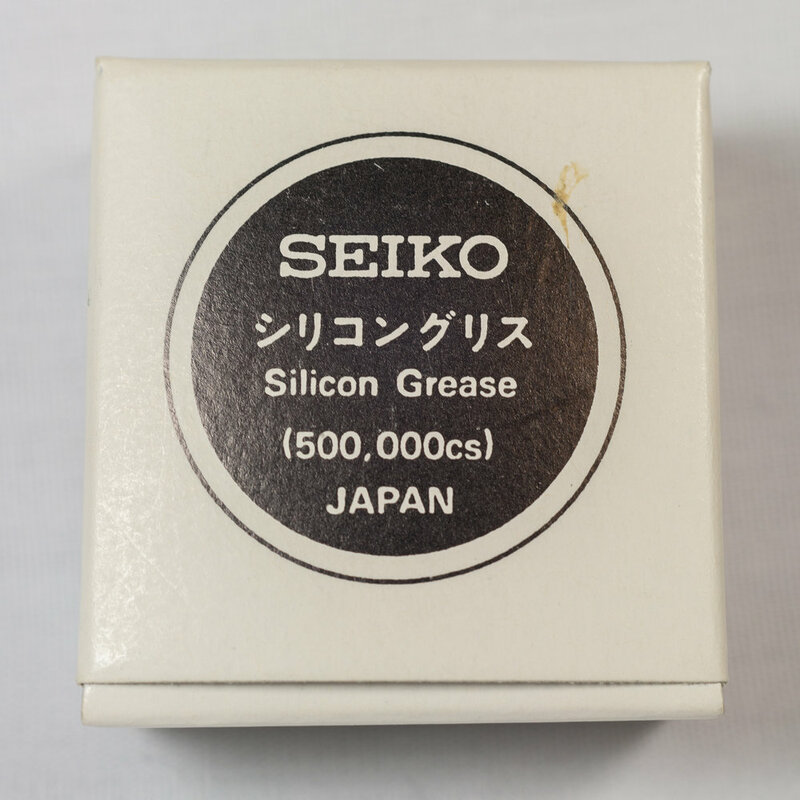 This is a 4 gram screw top container of silicon grease that is used on crown and case gaskets to improve water resistance and longevity. 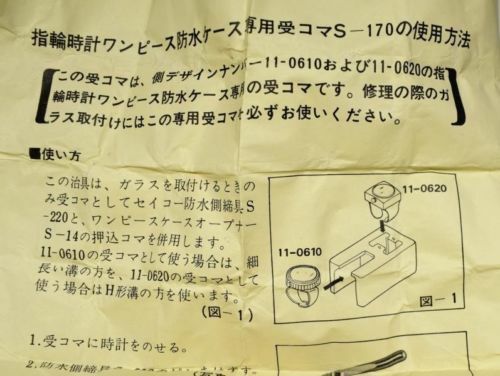 This tool is designed to remove the case backs from Seiko waterproof watches. The tool is from the early 1960's and comes with a couple of holders for the watch body. First is a simple case ring that is sized at 31mm on one side and 32mm on the other. 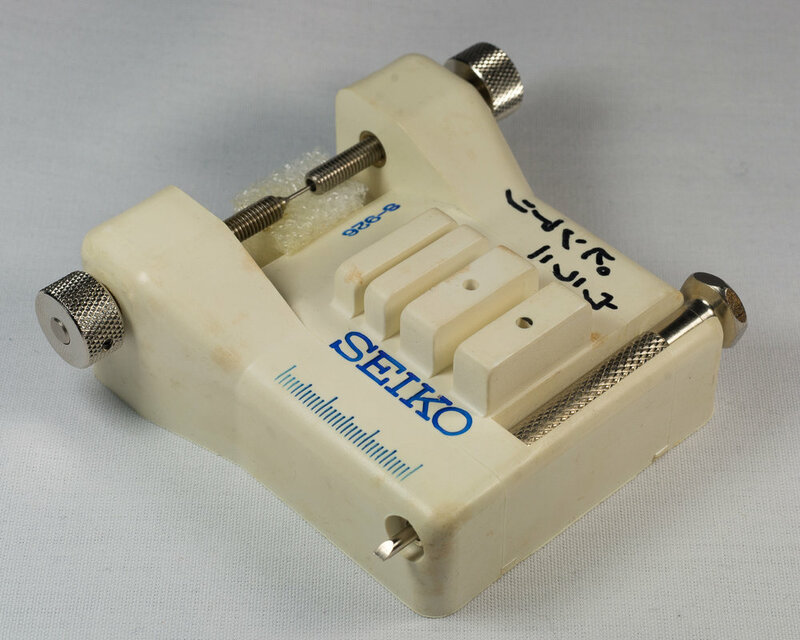 This is used for the removal of the watch crystal. The second holder is designed to fit around the complete watch body and be held in a bench vice. Once this is secured the metal case back removal tool can be used to open the screw down case back. The tool set was released in the late 1960's that include a number of opening tools and case holders. There is an adjustable three pronged opener that is able to be used on different sized screw back cases. 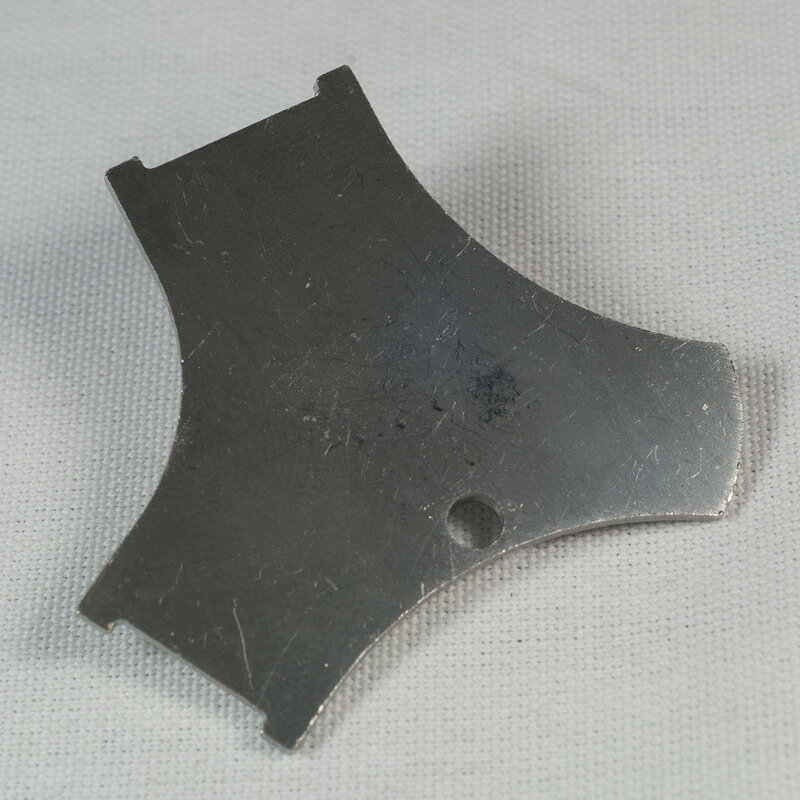 There is also a pair of openers with decagon shaped openings, one is 27.0mm wide and the other 28.0mm wide. The set also has three case holders that are sized on the diameter of the watch case. Each holder is also measured in 1/10mm size and they are marked 340, 355 and 370. The holders are designed to be secured in a desktop vice via a rectangular lug on the base.